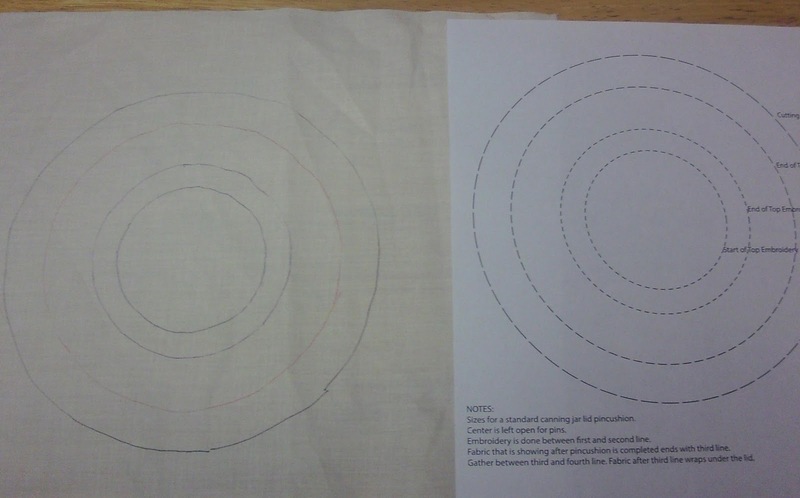 Step One: Trace the Circle on the Design sheet at Part 1 of this Tutorial on to your Foundation Fabric. 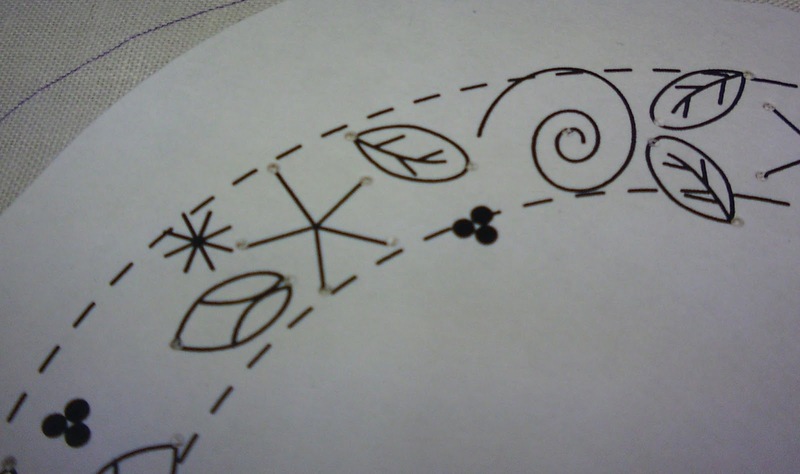 This tracing is on the back of the fabric. 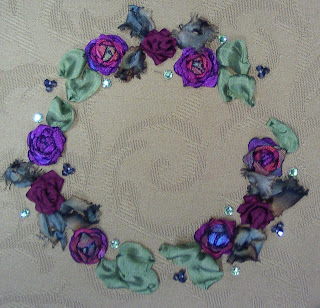 Step Two (Optional): Each design will include a reverse design that includes "dots" to mark the position of major elements in the design...such as the top/bottom of leaves, center of large flowers, spokes of the wrapped rose, etc. 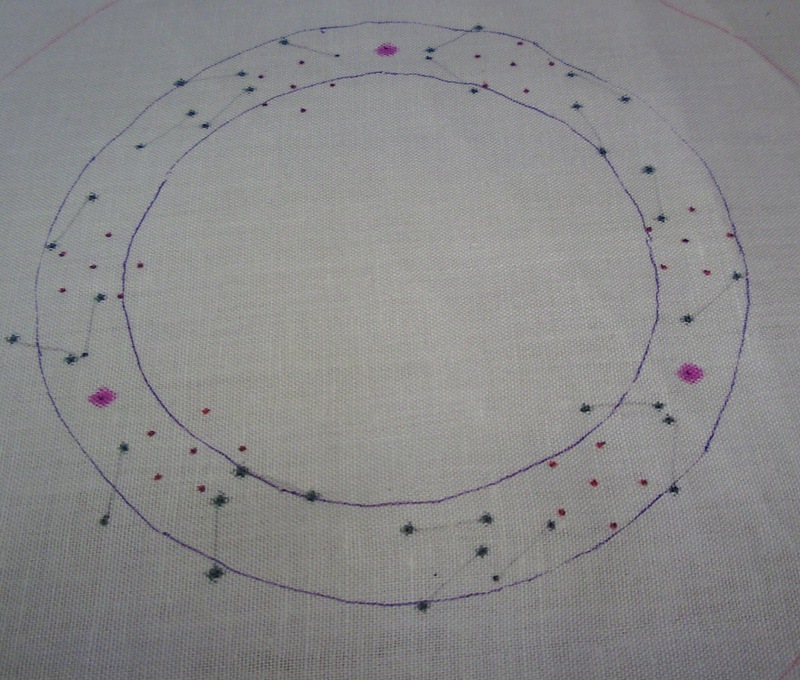 Transfer the dot markings from your chosen Pin Cushion Design to your Foundation Fabric Circles to mark placement of flowers, leaves, etc...as you wish. 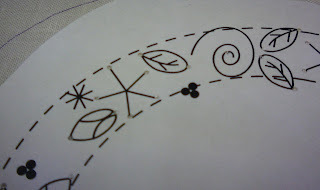 You can also freehand all of the design if you don't want to create it so literally. Here is how the design looks with just the holes on the back. 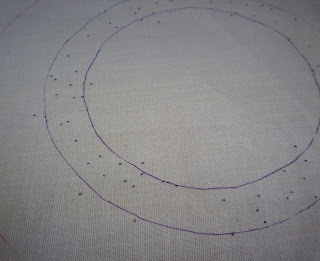 Now, use these holes as placement for a sharp lead pencil...and transfer the "dots" to the muslin foundation fabric. 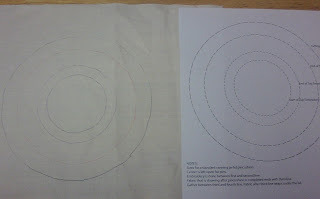 Step Three (Optional): Annotate your design so that you can clearly understand "what the dots mean". 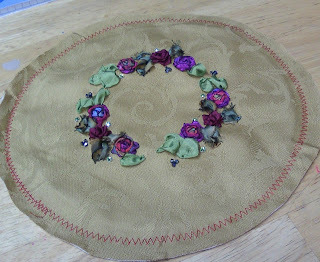 Here, for example, I have used different colored pins to go over the dots again for different design elements (red dots for the spokes and center of the Wrapped Roses, larger pink dots for the French Knot Gathered Roses, green dots for the leaves); have draw a line between the top/bottom dots for each leaf; and (later on) have added a squiggly line to remind me of which leaves were detached chain stitch ribbon leaves instead of the stab stitch ribbon leaves. 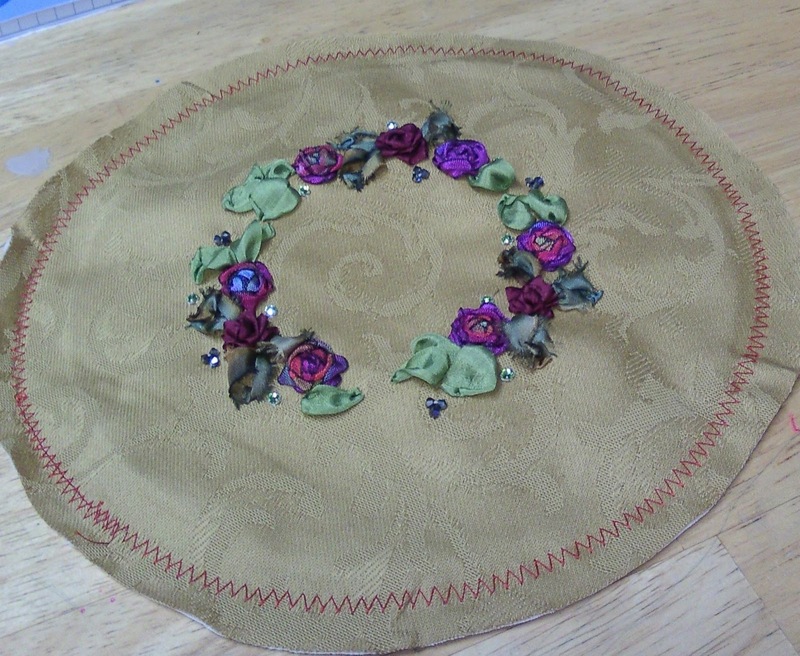 Step Five: Complete the embroidery, silk ribbon, and beading as the design reflects. (Shown in Part 3 of this tutorial). Set this completed top section aside for now. 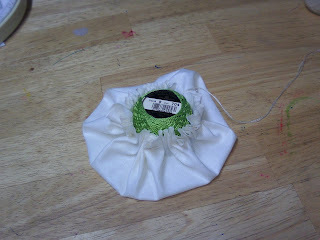 Step Seven: Fill this "lining bag" with poly fill. 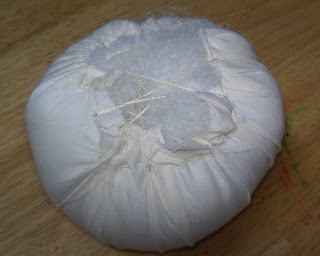 Use small amounts...over and over...stuffing and packing until the lining resembles a tight little round pillow. 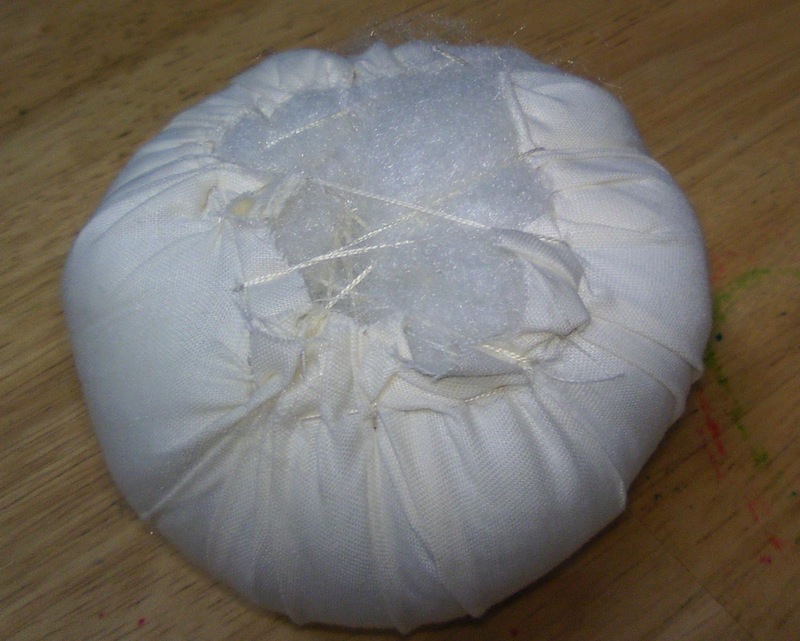 Take a piece of cord and criss-cross over the opening to keep the stuffing in place and to draw up the sides to create a nice shape. Poke more stuffing inside if you need to to get this nice and firm. 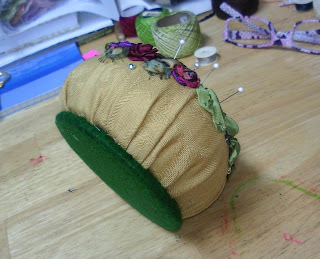 This will be the inside of the pin cushion. 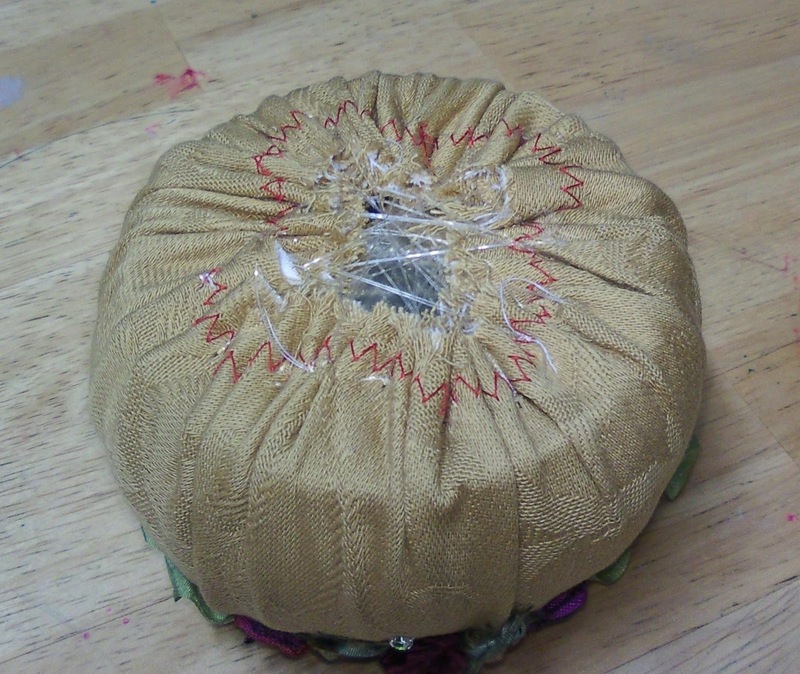 Step Eight: Take strong cord/thread and gather the finished top of the pin cushion.Place the stuffed lining and then one of the large mouth jar lids into the top. Draw up the cord and gather the top around the lining ball of stuffing...and around the jar lid. 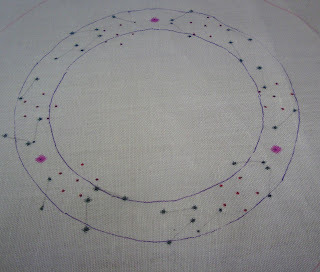 Draw this up tightly (that's why you need really strong cording). 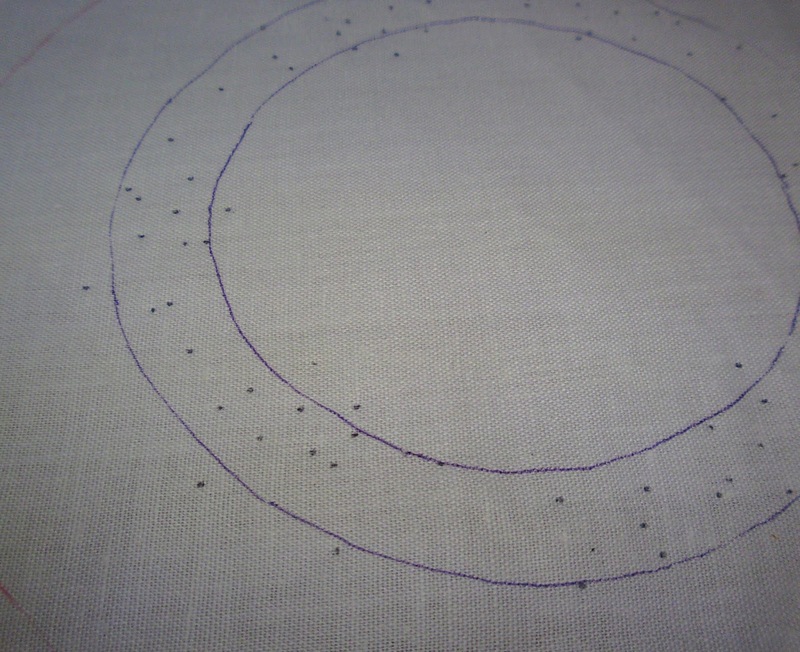 Take a few stitches to anchor...and then criss-cross the excess thread until you have secured the gathering pleats as nicely as possible. You might need additional pieces of cording to get this neat. Using the canning jar lid as a guide, cut a circle of felt about one-inch larger than the lid on all sides. Gather this around the lid. Secure the gathering thread. Step Ten: Use E-6000 glue or tiny stitches (or both) to secure the bottom felt piece to the top of the pincushion. 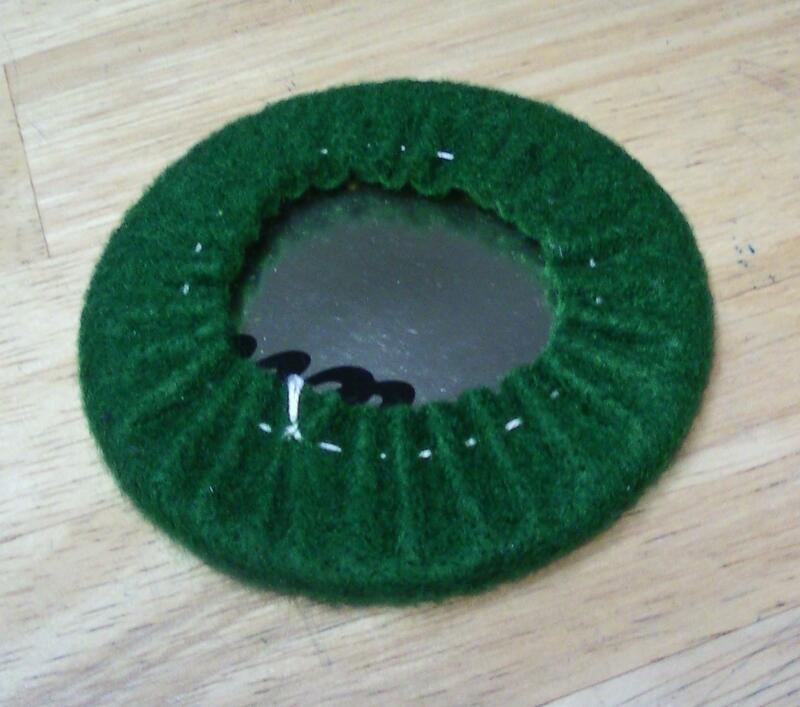 You can also cover any space between the two with trim if you desire. 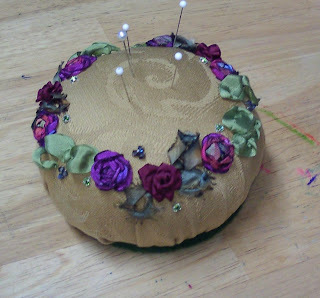 Tomorrow, we'll talk about the first of the Pin Cushion Designs (PCD) in this series.